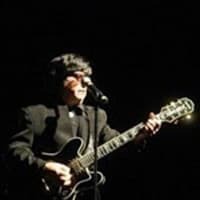 In my shows I try to capture Roy Orbison’s sound and style, as a Roy Orbison Celebrity Look Alike Impersonator Lookaike Tribute Artist creating a memory-invoking time for concert venues, private parties and corporate events. I can play Roy’s music live with my guitar, or I can provide custom tracks for a Roy Orbison Roy Orbison Celebrity Look Alike Lookaike Impersonator Tribute Artist. Capturing the Essence of ROY ORBISON is a task few could begin to achieve. Known to have a three to four octave range, combined with his impassioned voice and complex musical arrangements, he was call the Cruso of rock,’ ELVIS ONCE SAID, ORBISON’S VOICE IS THE GREATEST AND MOST DISTINCTIVE I HAVE EVER HEARD!” He has achieved the impossible, capturing Orbison’s voice, style and aura as a Roy Orbison Celebrity Look Alike Lookaike Impersonator Tribute Artist. Invite Roy Orbison Look Alike Impersonator to your next event. He never disappoints and is always a big hit with his wonderful stage show. After his show he will stay around for pictures with all of your guests.